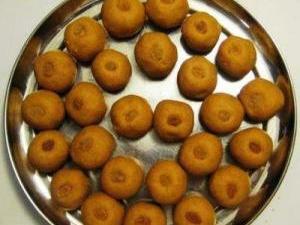 Prathu's Food: Besan Laddu - Passionate Cooking for Vegeterian Food. Add the gram flour and fry it on a low flame stirring continuously till brown. Once it is browned, let it cool. Add powdered cardamom and sugar. Mix well. Add chopped almonds and raisins. Shape into ladoos and serve.